PropertyShark's air rights map, published recently on the Real Deal, may very well be your tool for decoding where developers may be headed next. It shows where there's still lots of air rights available—important if you're a real estate investor looking to build the next high-rise. A quick primer: Air rights are developable assets that exist above a building if it isn't as tall as what the neighborhood's maximum heights are. According to the website Air Rights New York, "if a building adjacent to a construction site is lower than neighborhood zoning laws allow, the developer can acquire the building’s unused air space, add it to his or her project, and erect a taller building." If you live in the far eastern stretch of the Lower East Side, for instance, there may still be tons of construction-crane-dodging in your future, as your neighborhood still has more than 250,000 square feet of air rights—the top tier, per the map—available. Ditto Roosevelt Island, Canarsie, and Astoria. As for parts like Park Slope and Williamsburg, and Manhattan neighborhoods like the Upper West Side and Midtown—you're good. 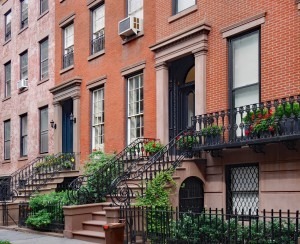 The map says there's "very little opportunity" for air rights in these areas—but that could be said for buyers, too, given how high prices have gone, according to the recent Manhattan market report, and how little inventory there is on the market.